Dr Conray Moolman obtained his undergraduate degree (MBChB) at the University of Free State in December 2000. He gained valuable experience in general medicine working in the United Kingdom for three years before completing his urology training (FCUrol) at Groote Schuur Hospital and the University of Cape Town in May 2010. He also completed his Master’s degree (MMed) at UCT in 2011. His Master’s work was based on research he did on the management of traumatic kidney injuries. He has three research papers published in esteemed medical journals. He completed his advanced laparoscopic urological training in Strassbourg, France. This allows him to perform complex urological procedures with minimally invasive laparoscopic techniques. 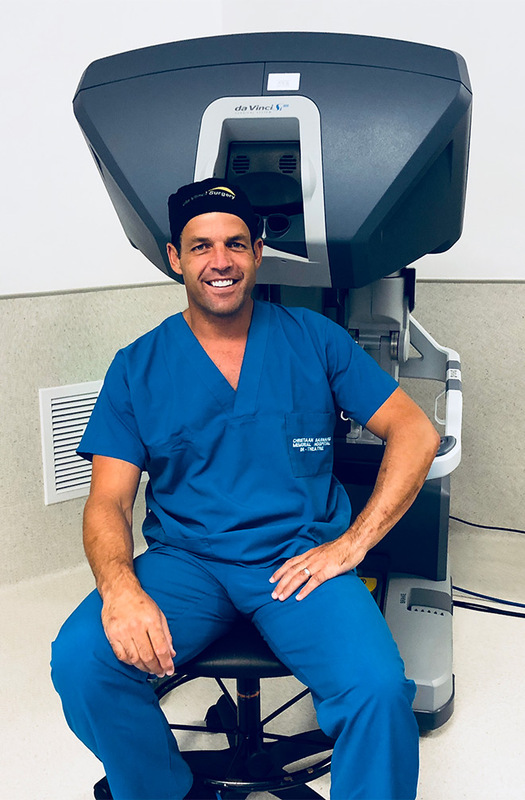 He has been accredited by Intuitive Surgical to be a qualified training proctor for other urological surgeons to master the technique of robotic prostatectomies. He also regularly attends international robotic surgery congresses and symposiums to stay up to date with the newest and latest technological and technical innovations in robotic surgery. He has a special interest in minimally invasive “key hole” urological procedures (robotic and laparoscopic surgery) and reconstructive urological surgery. He is currently involved in outreach programs to other African countries to perform reconstructive urological surgery. Dr Moolman performs all his robotic surgeries at Life Kingsbury Hospital and sometimes at Netcare Christiaan Barnard Hospital. © 2018 Dr Conray Moolman, Robotic & Laparoscopic Urological Surgeon. Website designed & hosted by Personalised Promotions in association with SA Medical Specialists.